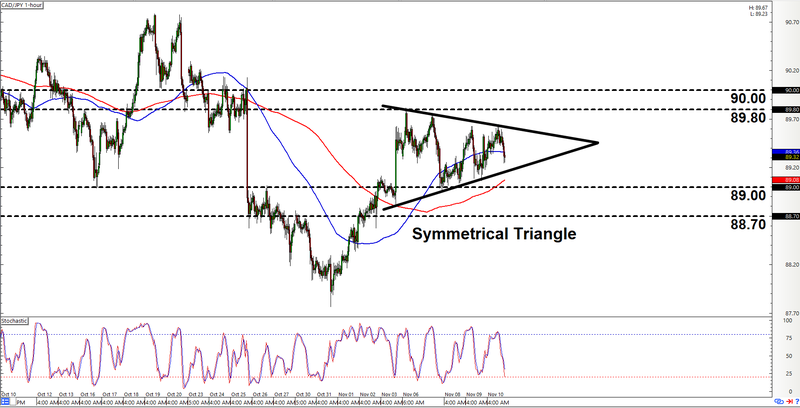 I’m ending this week’s intraday charts update with a channel on CAD/CHF and a triangle on CAD/JPY. That means I’ve been serving up chart patterns the entire week. That’s so dope! 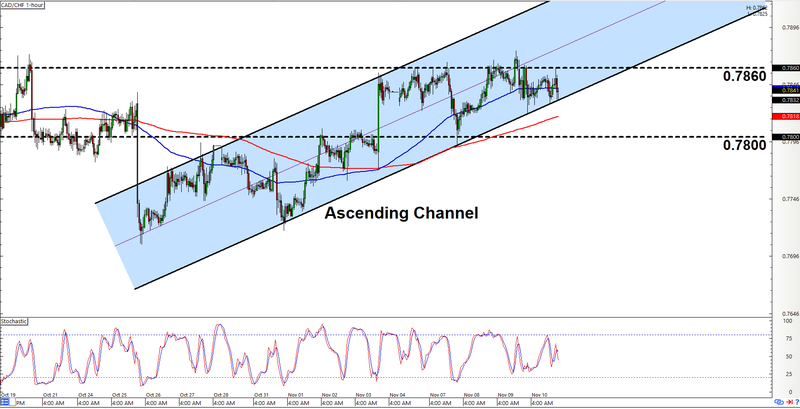 CAD/CHF has been trending higher while respecting that there ascending channel on its 1-hour chart. And as I always say, one of the more conservative ways to play an ascending channel is to look for opportunities to go long if the pair is at or close to the channel’s support area. And as it turns, out that’s where the pair is currently at. Y’all therefore better start looking. Do note, however, that them bears appear to have entrenched themselves at 0.7860. So y’all may wanna wait until the pair clears that before jumping in with longs. That also means that there’s a higher-than-average chance for a downside channel breakout. So just be ready to bail or cancel yo longs (or even go short) if the pair does stage a downside channel breakout while smashing past 0.7800. CAD/JPY has been trading sideways while tapering into a point. And in the process, a fresh symmetrical triangle has formed. A symmetrical triangle may break either to the upside or the downside. As such, we don’t really have a strong directional bias on the pair and y’all may wanna prepare for both an upside and a downside scenario. Just note, though, that an upside breakout needs to clear both 89.80 and 90.00 before the breakout is validated. A downside breakout, meanwhile, needs to smash past 89.00 and 88.70. In any case, just make sure to practice proper risk management, a’ight? Peace! See y’all again next week!